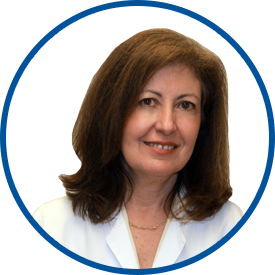 Dr. DeLasho has been in private practice in White Plains since 2001. In her gynecology- only practice, she sees women of all ages, with a special emphasis on perimenopause and menopause. She is board certified and is a Fellow, American College of Obstetrics and Gynecologists. After receiving her medical degree from St. George’s’ University School of Medicine, Dr. DeLasho completed her residency training at Boston City Hospital and an ultrasound fellowship at King’s College Hospital in London, England. She was previously attending staff at Saint John’s Episcopal Hospital, where she supervised residents and house physicians. After that, Dr. DeLasho was a staff physician with Kaiser Permanente and served as the OB/GYN department’s acting chief. She is a member of The North American Menopausal Society and The Westchester OB-GYN Society. She is affiliated with White Plains Hospital and The Rye Ambulatory Surgery Center. Dr. DeLasho joined Westmed Medical Group in September 2013. Dr. Delasho is outstanding. I have recommended her to friends and they love her. she has a very warm personality and definitely takes any concerns seriously. I have recommended *Dr. Delasho & her team to others recently and in the part. She and her team are great, knowledgeable, skilled and supportive. *Dr. Delasho is a wonderful, caring physician. Dr DeLasho is amazingly kind, super intelligent and leaves me feeling better whenever I see her. I can't say enough good things about Dr.Delashio. She's caring, considerate and attentive to her patients, she's one of a kind. Dr DELASHO was excellent. She took the time to answer all my questions. I have recommend Dr DELASHO to several of my friends and they are all happy with her. Dr. DeLasho is the best! I have already recommended Dr. DeLasho to others. She is one of the few doctors I will drive a full hour to see and will continue to do so even though I could easily choose a local provider. I have been a patient of Dr. DelLasho's for many years. As far as I'm concerned she saved my life: she took me seriously and immediately followed up with tests and referrals so I could be diagnosed and have surgery I needed. The doctor was very warm and friendly and attentive to my questions and concerns. She took the time needed and was informative. I have already told people that I would recommend her for their care. Dr. Delasho was very thorough and thoughtful in her approach. She explained everything to during my examination and had great humor throughout my consultation. I was very impressed with the amount of time she took with me. it made me feel very comfortable and at ease. I have reccomend my doc to a bunch of family and friends and they love her! Very caring and knowledgeable doctor, *Dr. Delasho!!! Dr. DeLasho is the best. she listens to what I have to say and seems to genuinely care about what i have to say. She answers all of my questions. She makes me feel totally comfortable in speaking with her. Dr. De Lasho is a wonderful, genuinely caring woman...the best! I am glad I found her! I fly in from California because of the excellent care and treatment I receive at WestMed.